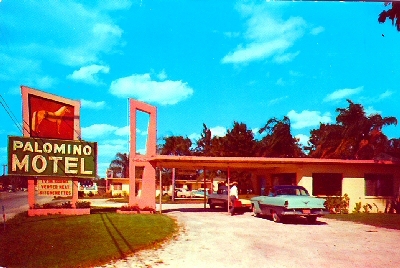 "Palomino Motel - Orlando, Florida - C 1956. " (1920) POSTCARD: Palomino Motel - Orlando, Florida - C 1956. -Condition: Very Good. - Has Not been Posted. Photo of front of motel with cars. Back of card states it is an attractive well managed motel on shaded landscaped ground. And it was air conditioned! It was owned by Mr. and Mrs. W. C. Champion, owner of Palomino horses and Brahman Cattle. As of December 1945 W. C. Champion also had a fertilizer company and is mentioned in the Orange County Board meeting as placing a bid for supplying fertilizer.Price: $4.00 + shipping.